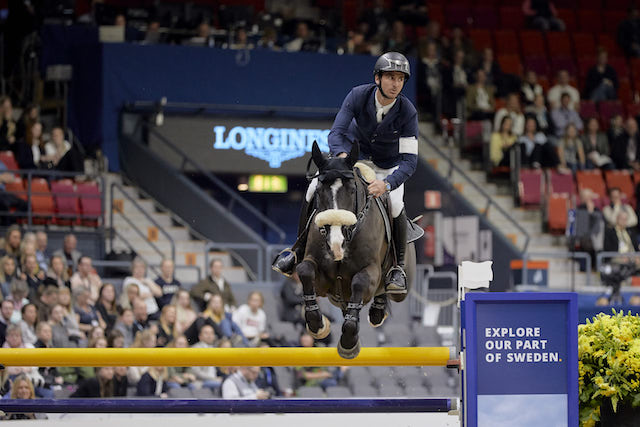 Two-time World Cup champion and self-confessed media phobe Steve Guerdat (SUI) leads after Round I of the Longines FEI Jumping World Cup™ Final in Gothenburg, Sweden. Aboard Alamo, the reigning world number one narrowly topped of a field of 33 after posting the quickest fault-free round of the day—61.28 seconds—over the Santiago Varela-designed track. Less than two hundredths of a second separate the top three. Belgium’s Pieter Devos and Apart sit in second on the leaderboard with a time of 61.31 seconds and Olivier Philippaerts and H&M Legend of Love, third in 61.43 seconds. But what separated Guerdat in the press conference was his winning mindset. Just about every soft spoken statement from the 36-year-old Olympic gold medalist was a lesson in keeping a clear head and putting your horse first. Take away: Invest your energy wisely. Take away: Focus on the variables within your control. Take away: Make a plan based on your horse’s strengths. Take away: Believe in your plan. Take away: Actively reflect on your performance. Take away: Respect your horse’s needs. Take away: Train and then test your training. Take away: Always remember your purpose.